Rafting on the Tara River, in its own right, is for many tourists the primary reason for visiting Durmitor. The rafting experience is an exceptional one, so we suggest you do not miss out on it, should you have time. Rafting on the Tara River is an old tradition. Historically, Evergreen tree trunks, cut down in the canyon for the needs of lumber industry, were transported down the Tara all the way to Bosnia, to the Drina River. Even today you can raft on the Tara on traditional, wooden rafts, which, like in the old times, are made for single use. At the end of rafting, in Šćepan Polje, the rafts are disassembled and the trunks are not transported back, but used in Bosnia instead…. Rafting on wooden rafts is a lot more expensive than in new, modern, rubber boats, however, if you are in a company of several people, if you have the time and would like to raft in a classical way, you can get all the necessary information in local tourist agencies or directly from the raftsmen. The tour with rubber boats is categorised according to mileage, rather than by duration. The most frequent and the shortest tour, which tourists, due to the lack of time, typically take, is the one from Splavište (3km upstream from Tara Bridge, towards Mojkovac) to Žugića luka. The tour is 12km long and lasts from 10am, when you are driven by your rafting tour organisers from your accommodation to Splavište, until around 4pm, when you are driven back to where you lodge. The rafting price includes the ride in both directions, rafting, food, insurance and National Park Tax. This short tour is a wonderful experience and although you will not get the chance to see the canyons most beautiful parts, nor the strongest rapids, it is worth making and, at least for a short time, be on this fascinating river and enjoy the amazing nature of its fairylike canyon. A medium length tour (36km) travels on to Radovan luka. It is also a daily tour, and its duration depends mostly on the company and atmosphere in the boat. During this tour you will see the most beautiful parts of the canyon and the river itself. We will not list the places you will pass by, since the names of whirlpools, springs, river bends, canyons of Tara-s tributaries do not bear any meaning. The Tara and its canyon should be experienced first-hand. Rafting on the Tara along its entire length, i.e. the length on which rafting is feasible, can take two or even three days (sometimes even four, if you make such an arrangement with the organisers). In some packages, the journey is broken off after day one in Radovan luka, whereas in others the 70km length to Brštanovica is covered. The price of your package includes, and it will be made clear to you by the organisers, accommodation as well as food and drink, taxes and insurance. The last part of the Tara flow is the quickest, so in the last 12km, from Brštanovica to Šćepan Polje, you will experience what white water rafting is all about. The rafters are, however, experienced and very skilful, so you should not be concerned about your safety. The total length of the Tara from Splavište to Šćepan Polje is 82km. Šćepan Polje is a place at the confluence of the Tara and the Piva rivers, forming the Drina River. It is situated on the territory of the Republic of Bosnia and Herzegovina. 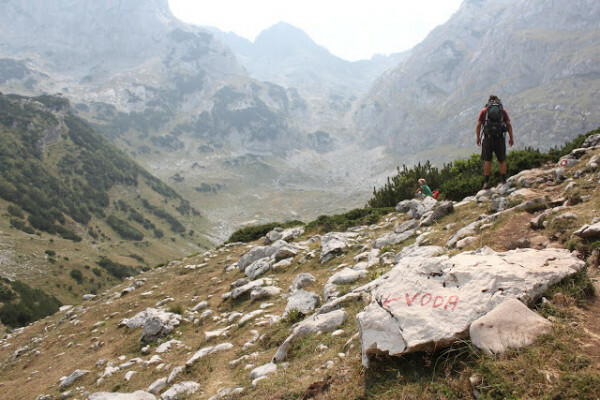 The way back, from Šćepan Polje to Žabljak, is an experience of its own kind. 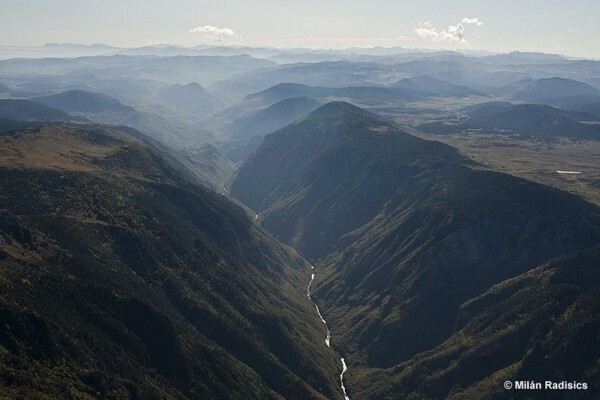 You will get to see the Piva canyon, Mratinje, a huge hydroelectric power plant, whose dam is 220m tall, and extremely picturesque parts of the western side of Durmitor. We are unable to list prices of rafting tours because the prices depends on the number of guests taking the tour, length of tour, the time of year, time of day (early or late morning) number of children, options with or without food, sleeping arrangements (in camp bungalow or motel). 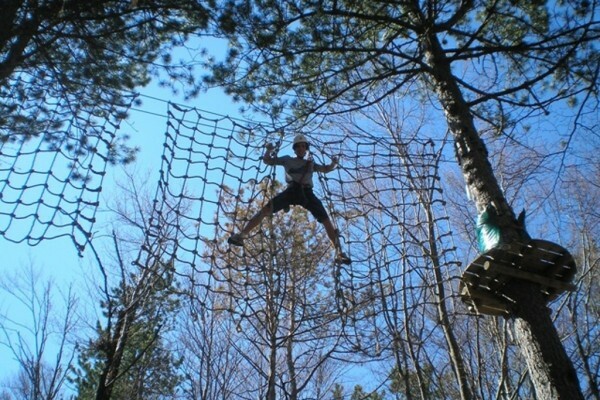 We also arrange ‘team building’ activities and rafting programs. However, indicative prices are 30 – 45 Euro for half day rafting up to 120 Euro for a full day tours. Multiple day tours are from about 70 Euro upwards. All prices include food and drink, national park tax and insurance. Some tours also have included in the price accommodation and transfers. We always aim to get our clients the highest discount / lowest rafting prices available in the region and ensure high quality trips, equipment, food, accommodation and the use guides with certification. Please contact us by Email with your rafting inquiries and re will respond quickly, with the correct price and information. We check our Emails at least twice per day so your response from us should be the same day. We can organise variants of programs listed on this page, of one or more days, depending on your wishes. We arrange accommodation and food in the camps by the river, in the wild nature or in our own camp. We can arrange additional activities such as fishing, photo safari and jeep tours as part of the same trip. We can arrange transfers from all biggest towns in Serbia and Montenegro. Our rafting partners provide all the necessary equipment, yet you should bear in mind, especially if you make a longer tour, not to forget to take two pairs of shoes, clothes to change into, a phone charger and personal ID (passport), because the tour ends in another states’ territory. We can organise rafting on wooden boats as well as modern rubber ones. All moderns boats and equipment our partners use are almost new. One day rafting on the Tara river of length of 60 km with little break and breakfast in Radovan luka (on 24th km) and lunch in Brstanovica (on 50th km). Program include taxes, insurance, tickets for entry into the National Park, driving with boat, serving of guide and others employment, accommodation, food, visiting places and one drink with lunch. Condition: minimum 5 or 6 persons(to 8-9 persons). Three days rafting on the Tara river on length of 60 km with sleeping in Radovan luka (on 24th km) and Brstanovica (on 50th km). 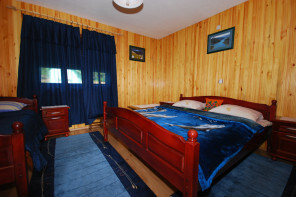 Accommodation in wooden bungalows, three meals per day. Program include taxes, insurance, tickets for enter in National Park, driving with boat, serving of guide and others employment, accommodation, food, visiting places and one drink with lunch. Program begin on the bridge on the Tara river, returning from the finish cross the Durmitor to the Zabljak or to the bridge on the Tara river. Condition for program minimum 5 or 6 persons(to 8-9 persons). One day rafting on the Tara river on length of 24 km (to the Radovan luka) with sleeping or without sleeping. 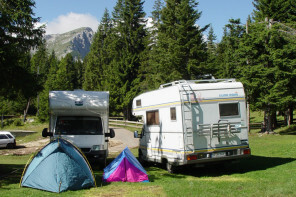 In returning to the Zabljak or to the bridge on the Tara river we doing jeep tour through the heart of National Park Durmitor in length of 25 km. 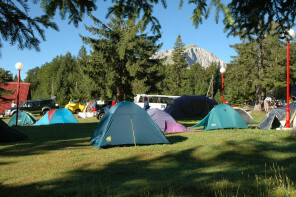 In option of sleeping we offer accommodation in camp on start or finish, or in Zabljak in Camp Apartments Razvrsje. Program include food, accommodation and transfer. Condition for program: minimum 5 or 6 persons (to 8-9 persons). One day rafting on the Tara river on length of 12 km (till the Lever Tara-Zugica luka) with returning with jeeps to the camp behind the bridge on the Tara river. Program include one meal and one drink (baked or boiled lamb or wheel or baked fish),number of guests is not condition!!! One day rafting on the Tara river on length of 12 km(from Brstanovica to the Scepan polje) with sleeping or without sleeping in some of camps before or after rafting. Program include food, accommodation and transfer. Condition for program minimum 6 persons.